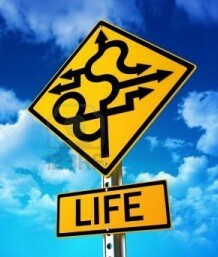 Life has so many twists and turns, sometimes I worry about whiplash! Recently I lost a regular client. I didn’t enjoy the work and wanted to leave but held on for the stability of the income. So I sold out. I was doing work that did not speak to my soul and I promised myself I would never do that, that I would only do what made my heart sing. And, of course, it did not end well. I showed up and did a good, but not great, job. And, at the end of the day, I believe I thought myself out of that job. Does that sound ridiculous to you? I can certainly understand if it does. But, did you know that legitimate scientists around the world study the field of Quantum Physics, which is the study of the smallest particles in existence – atoms. It turns out that these elemental particles are nothing more than a vacuum waiting for a particular vibratory energy to pass through it thus causing that vacuum to somehow form into measurable points and waves of vibration. Scientists like Einstein, Heisenberg, and Planck understood that energy becomes matter. After all, E=MC2 expresses the fact that mass and energy are the same physical entity and can be changed into each other. Also referred to as Quantum Mechanics, this field has intrigued scientists, religious scholars and meta-physicians for decades. Given that our religions teach us (in one form or another) that “we reap what we sow.” The golden rule teaches us to “Do unto others as we would want done to us.” It really is “Do ‘good’. Get ‘good’. Do’ bad’. Get ‘bad. '” I get it. And I also get that the energy of my negative thinking about this job impacted the outcome. It was in my control. It still is. Everything is. So what happened? How did I handle this unexpected loss of income? I did not moan or worry. I had faith that everything is perfect and I took the opportunity and dove into creating a website that truly reflects the Savvy Senior. It had been on my “to do” list for months. Check that box! And then one afternoon as I sat at my computer looking through meetup.com, it suddenly occurred to me that I could create a meetup called the Savvy Senior Club. I did and before I knew it, hundreds of seniors were joining. And so a baby was born from the ashes of that lost job. And I will nurture my baby and grow it so that I can help seniors from Aventura to Boynton Beach conquer aging so they can enjoy the many benefits it brings. I encourage you to be a Savvy Senior. Be aware of your thoughts. Are they tending toward the negative? The complaining? The not enough of this and too much of that in your life? It’s common. Almost every person does it. It’s called being human. But…the Savvy Senior knows the benefits of kind thoughts and loving actions. The Savvy Senior knows that positive thinking impacts health in a positive way. Even mainstream medical institutions like the Mayo Clinic understand that “Positive thinking helps with stress management and can even improve your health.” Still not there? Check out this well-researched article on the power of positive thinking from Health Ambition. Be a Savvy Senior. Take control of what you think and maybe follow a little advice from Tinkerbell and “Think happy thoughts.” You never know how high you can fly! « Previous post link How Can I Be of Service to You?